"Bond, James Bond." He's back and it's better than ever! 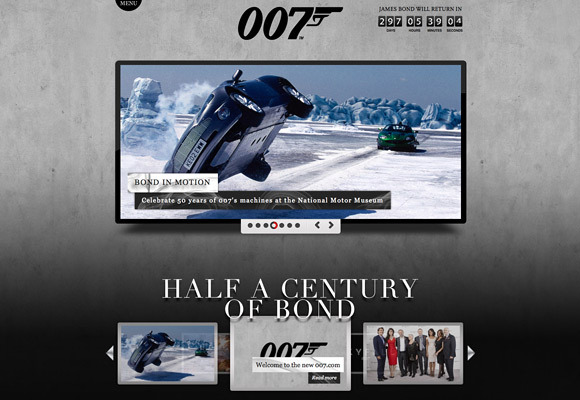 An impressive new website has launched at 007.com to kick off the New Year, honoring the 50th anniversary of James Bond movies. The site not only contains a blog and updates on Skyfall, the 23rd Bond film now shooting with Sam Mendes at the helm and Daniel Craig back as 007, but an archive and look back at many Bond trinkets of past (put on some Bond music in the background and your experience will be complete). You can also check out the first Welcome-Production Video, which is pretty damn cool to see, almost a bit like those Hobbit videos. Enjoy! Here's the new synopsis for Skyfall: Bond's loyalty to M is tested as her past comes back to haunt her. As MI6 comes under attack, 007 must track down and destroy the threat, no matter how personal the cost. Skyfall is being directed by Sam Mendes (American Beauty, Road to Perdition, Jarhead, Revolutionary Road, Away We Go), from a script by John Logan, Neal Purvis and Robert Wade. Helen McCrory and Ola Rapace will appear in Skyfall, joining previously announced stars Daniel Craig as James Bond 007, Javier Bardem, Dame Judi Dench, Ralph Fiennes, Albert Finney, Naomie Harris, Bérénice Marlohe and Ben Whishaw. You can also follow the twitter @007 for updates as well, as they've tweeted out production photos and more info. Columbia Pictures already has Skyfall set to hit theaters on November 9th. We'll continue you to keep you updated on all things Bond, as it looks like 2012 will be a big year for Agent 007. Is ola related to noomi? Yes. I think they may be cousins or siblings. Both are Swedes. I think they are or were together. I think The Hobbit's marketing is already showing a lasting effect on the rest of the business. Love it. This is nothing new. Peter Jackson started it with a very in-depth look at the making of King Kong. Which was then followed by a Superman Returns behind-the-scenes blog. So I don't think The Hobbit's marketing has one single thing to do with this. I saw all the King Kong and Superman ones, but neither were nearly as popular as these are now becoming. Agreed, Alex. As long as they don't have spoilers! Ola and Noomi has been married. I think Daniel Craig has signed the next 5 films for the 007 franchise.